You won’t find children lining up outside your local cineplex to see Justice League: The New Frontier, one of 2008’s best animated features, because it was never meant for theaters. Released as a direct-to-DVD title by Warner Bros. Animation (the studio behind last year’s Superman: Doomsday) for an intended home video debut, the film isn’t amassing Pixar-sized numbers. Rather, it appeals to older audiences and comic book aficionados by telling an adult story, historical in nature, without reliance on overt superhero action and eye-popping special effects. Based on DC Comics’ 2003-04 six-issue limited series DC: The New Frontier, with artwork and writing by Darwyn Cooke, the film offers welcomed familiarity for those of us versed in producer Bruce Timm’s previous animated DC Comics output. Beginning in 1992 with his masterful Emmy-winning show Batman: The Animated Series, Timm ushered-in a new standard for televised cartoons by innovating on traditional animation styles, as well as emphasizing the sometimes dark qualities of the DC Universe. His approach is classical, yet contemporary, creating the standard against which all live-action comic book films should be judged—indeed, even the comics began to use characters invented for his cartoons (most significantly Harley Quinn, The Joker’s sidekick-lover). Continuing with the readily watchable Superman: The Animated Series, Batman Beyond, Justice League, and then Justice League Unlimited, Timm placed each of his series in the same pitch-perfect continuity. 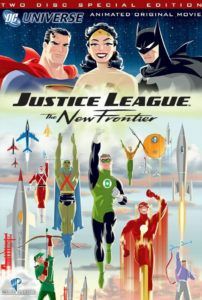 But The New Frontier is just as its title suggests, wholly independent from Timm’s DC continuum. The story begins with the end of the Korean War, after WWII’s black-and-white concepts of good and evil have become ambiguous, when The Cold War’s suspicion-frenzied McCarthyism dominates. Heroes once trusted by the government are now suspect; in one scene, someone calls The Flash a “commie” for his red getup. With a monstrous worldwide threat looming—a being called “The Center”—classic heroes like Superman, Batman, and Wonder Woman must band together with a newer breed of hero consisting of The Flash, Martian Manhunter, and The Green Lantern. By the film’s last scenes, together they assemble the Justice League of America. Cooke conceived his narrative to fit with DC heroes’ original origin stories. Each character arrives in Cooke’s timeline when he or she actually debuted on the page, hence the film’s period setting. By doing this, Cooke addresses how America’s 1950s Red Scare epoch would not have allowed superheroes their control. Cooke claims we would have cast them out, later trusting them again with the hope and progress-guided presidency of John F. Kennedy. And though Cooke doesn’t directly make mention if such heroes would prosper in contemporary society, one expects not. As Martian Manhunter asserts, our culture relies too much on fear and blind self-importance to trust any one source of hope; we would be too concerned with the fearful motto “Who watches The Watchmen?” Though strong modern heroes and leaders are exactly what we need, our ever-constant mistrust no longer allows for them—hence, comic book manifestations to fill such needs. Further working from Cooke’s model, much of the film’s visual style combines his artwork from The New Frontier’s pages with the unique square-jawed human (and Kryptonian) forms found in Timm’s various animated series. Period detail and 1950s-style sci-fi fantasy gush from every scene, at once familiar to, yet separated from Timm’s previous output, allowing director Dave Bullock to establish his own separate identity for the picture. The result contains all the classicism of Jack Kirby’s storytelling, and the simplistic beauty of Alex Ross’ iconic art. 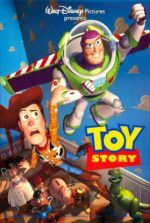 Once again we see why animation is an underappreciated art form—often thought of as “just kids’ stuff.” Rated PG-13, this film is anything but child’s play; within the first ten minutes we see suicide, graphic killing, and bloody vengeance. Animation moves beyond live-action cinema’s budgetary and representational limitations, with the ability to create any world, any special effect, at virtually no extra cost. With Hollywood currently producing a live-action Justice League movie under director George Miller, no doubt the budget will skyrocket to well over one or two hundred million dollars, whereas animated Justice League movies are comparably cheap, without monetary or resource hindrances. With modern animated films like Persepolis tackling adult issues, and then garnering due attention for it, there’s no reason future DC or Marvel Comics franchises couldn’t release successful animated films into theaters, as opposed to direct-to-DVD. 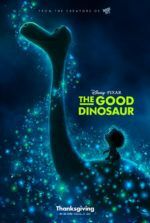 Computer-animated features today are a-dime-a-dozen—what’s more, they’re commonly lacking in narrative artistry and instead blatantly rely on children’s knowledge of pop-culture. 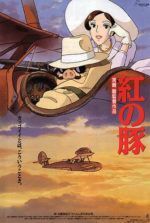 It’s rare a studio would invest in traditional animation for such an unconventional story. Warner Bros. sees the value in their DC Comics franchises, enough to support Timm and his established ideals for superhero animation; the result is a testament to their class. With future made-for-DVD titles on the way (Batman: Gotham Knight in July, and a yet-untitled Wonder Woman project set for 2009), this studio could single-handedly create a demand for adult-centric superhero films, each breaking boundaries in how we look at our most beloved heroes, just as Justice League: The New Frontier has done.